The Shaker Rolling Pin is a classic—possibly the same design your grandmother used. With simple lines and a solid feel, it rolls quickly at a weight of almost two pounds. Weight: Cherry: 1.8 lbs. ; Hard Maple: 1.9 lbs. ; Walnut: 1.6 lbs. Bought this rolling pin for my daughter after purchasing a marble rolling pin from another web site. I gave her both as a birthday present, but told her she could only keep one. I thought she would take them home and handle them both to see which one fit her hands and felt best as far as size and weight. She picked up the Vermont Rolling pin second and said she knew that was the one she wanted to keep. It was the perfect size and weight, she knew immediately. The walnut is also has a beautiful look. So glad I saw this on The Gromment. This is not only a beautiful piece of art-it works beautifully also! Properly rolled dough is crucial to many a culinary delight, be it pasta, pie, or tart. 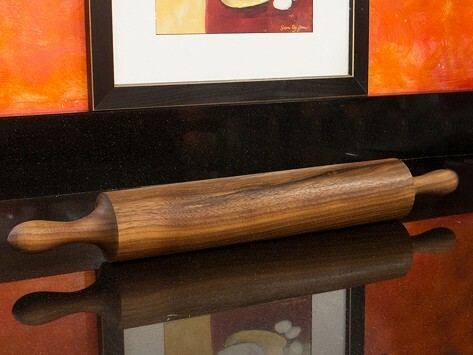 With a balanced, sturdy feel in your hand, and smooth, assured action on the countertop, Vermont Rolling Pins are artistry in motion. With patience and intuition, Ken hand-turns each rolling pin in his mountainside workshop as his watchful eye brings out the wood’s character. He sands until the pin reaches a satiny finish, then seals it with a protective beeswax mineral oil that enhances the natural beauty. 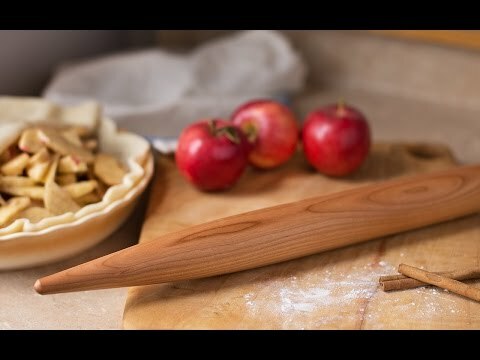 Vermont Rolling Pins make great gifts, but their handling and appearance are so superior you may just want your own. These heirloom quality instruments are made to be used—and admired—for generations.